ONYX avoids many of the distorting variables present with hardware scanners because it is touchless, resulting in a fingerprint that is a more exact copy of the actual finger. Internal testing and observation has revealed that ONYX creates fingerprints for matching which are superior to those created by hardware scanners. Accordingly, fingerprints generated by ONYX result in more accurate matches. More accurate matches equal greater security. Greater security available to mobile device users right now by only a simple software download, without the need for any additional hardware, resulting in a drastically reduced cost. Our mission is to bring fundamental change in the way law enforcement, governments, militaries, businesses and consumers interact on mobile devices. We give businesses more flexibility in delivering their data, products, and services, while providing their customers with a game-changing combination of increased security and convenience. We allow governments, law enforcement, and militaries to perform time and lifesaving identification in the field with low cost commercial off the shelf devices. ONYX is a software library written in C++, wrapped with Java for use on Android and Objective C for use on iOS, that acquires, processes, and matches images captured with the rear-facing camera of mobile devices. Accuracy: the high res images we capture from a mobile devices' camera are "normalized" with our software resulting in more accurate fingerprint rendering and identification. We have partnered with the global leader in fingerprint matching algorithms, Innovatrics, to provide best-in-class FAR and FRR. Reliability: our touchless solution is more reliable than touch-based or capacitive fingerprint sensor solutions which are subject to inherent physical limitations, including their vulnerability to wear and tear. Many other solutions have had problems dealing with different age groups and certain ethnicities; however, our internal tests have yielded excellent results in these areas. Faster, Broader Deployment: unlike the more common hardware solutions, ours is entirely software-based, which gives us the ability to deploy ONYX on most mobile devices that have a rear-facing camera..
Ease-of-Integration: ONYX can be quickly and easily integrated into a broad array of systems. Since it is software, any customization can be done on-the-fly without any form factor redesign. Upgradeability: our ability to push out over-the-air upgrades, fixes, and updates, enables us to continually improve the user experience and "future proof" our technology. The user places their finger in view of the rear facing camera. They then center that finger inside the on screen oval. The user's finger should be approximately 3-4 inches from the back of the phone, as this is the minimum focal distance of most smart phone cameras. Users must make sure their fingertip is approximately the size of the guide on the screen. Once the finger is in place, the finger detection algorithms trigger the autofocus and automatically acquire the finger image. Depending on your specific use case, ONYX can utilize any one of the above images. Device-based Solution: securely stores all user fingerprint information and performs all biometric functions on the mobile device, thereby providing the greatest available control of personal identity information. This solution is perfect for device access authentication, application authentication, and e-commerce authentication. By utilizing the existing cameras available on mobile smart devices, with just an easy software download any individual can experience the benefits of biometric authentication -- without the need to purchase expensive peripheral hardware or a new device with an integrated biometric sensor. Diamond Fortress' Device-Based Solution is a product of our dedication to user identity protection. Server-Based Solution: enables mobile devices to capture and process fingerprint images for authentication or identification. Once processed on the mobile device the template is securely transported to a remote server for matching against fingerprint images stored on the remote server. Diamond Fortress' Server-Based Solution is ideal for law enforcement field ID and governmental ID such as border control, and enterprise authentication where users regularly join and leave the system. It can be integrated into limitless applications such as existing physical facility access control systems and enterprise network authentication systems. This enables system administrators to easily control roles, permission sets, and add or remove users, while ensuring the highest degree of confidence that access is being granted only to approved users. Law Enforcement – evidence management/chain of custody software is becoming more widespread and our technology would enable providers to set themselves apart from the competition – at least for the short term until the technology is a necessity. Border Control / Misc. Govt. Solutions – fills enormous need to protect borders from illegal entry, identification of immigrants and other border security issues, plus innumerable other security uses. Health Care Industry – easy and inexpensive identification of medical care providers, pharmacists, patients, anyone who views or stores medical records or works in a medical facility as required by law; ONYX is also a perfect fit for mobile prescription-writing devices which are becoming more prevalent. Financial Transactions Market – mobile banking; point-of-sale purchases; mobile stock trading; currency transfers. In-App Purchases Market – consumers are making more purchases within mobile applications and enhanced security is desired by both businesses and consumers to prevent fraud. Mobile Device Management Market – enterprise solutions for identification and verification to protect proprietary, confidential and personal data; handle BYOD management, network infrastructure access. Login Identification Market – much-needed solution to ensure identity of person accessing a device, an application or the internet. OEM Market – we are already working with original equipment manufacturers to provide their clients with custom devices which incorporate touchless biometric security, the possibilities are limitless. Physical Facility Access Control – countless organizations are seeking a trustworthy biometric solution to control access to their facilities; we have begun to speak with some and have a tentative deal with a national 24-hour gym; the potential revenue is enormous. At present there are very few mobile phones or devices with built-in biometric hardware. 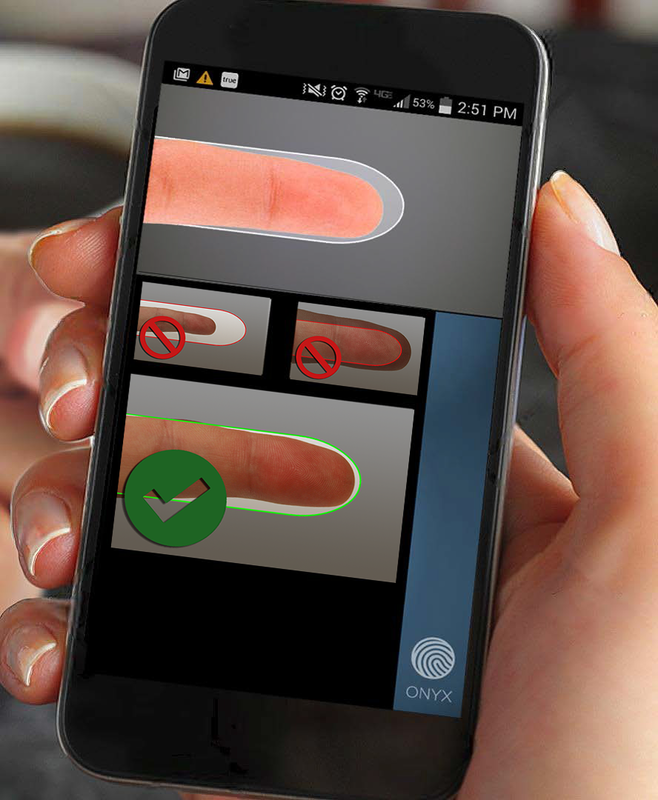 ONYX is the only mobile "touchless" fingerprint solution on the market. The cost of developing and incorporating small area biometric sensors such as Touch ID and Validity swipe sensors is a significant barrier and such hardware is unsuitable in many law enforcement, governmental, and enterprise applications that need one-to-many matching because the limited area of print captured. Add-on devices were the only widely available option until 2012 saw the introduction of a handful of devices with built-in biometric hardware. Our software-based authentication approach using the device’s native hardware (i.e. camera) offers a huge advantage. ONYX is specifically well suited to law enforcement, government and enterprise as ONYX generates a print of the full finger pad surface area of a consistently high quality; thus, facilitating highly accurate one-to-many matching. Highest fingerprint image quality per NIST standards. The Failure to Enroll Rate or FER is the percentage of the population which fails to complete enrollment. Such failures can be due to lack of training on how to enroll, to environmental or ergonomic conditions, or to certain demographics which make the biometric modality not suitable for a certain percentage of the population. Most manufacturers of biometric devices do not give clear numbers on the time it takes to enroll as well on the time for an individual to be authenticated or identified using their application. Touch-based sensor types experience FRR issues due to environmental conditions or incorrect use. Foreign matter on the fingerprint such as oil and grease, skin dryness, and the age of the person being fingerprinted can result in higher FRR. The finger typically needs to be applied on the sensor in the same manner (same position, same direction) and with uniform pressure (e.g., avoid pressing while twisting). The more finger area the sensor "sees", the better. FRR tends to lower when a user gains more experience on how to use the biometric device or software. Many of these issues are avoided by ONYX due to the touchless modality. With a close to 100% enrollment rate, ONYX meets or exceeds those by competitors who've published their enrollment rates. Processing time (from enrollment to authentication) is –.7-.9 seconds (per the specs included below). Security: ONYX Templates can be encrypted via RSA and AES 256-bit encryption and transferred over network via SSL and TLS encryption protocols. Security: Our heuristic finger detection algorithms are very good at assuming what is a finger and what is not a finger. These algorithms allow us to perform auto-capture of the finger. When the algorithm has determined that what it is seeing in the camera's field of view is a finger and it is in the correct location, the finger guide, it starts the auto-focus and acquires the image. This has the ancillary benefit of liveness detection, because the algorithms are based on finger color, lighting and shape. Photos tend to glare, and thus are not as easily recognizable as a finger. It is a minimal level of liveness detection, but is sufficient for most use cases. We have considered additional features such as detecting the motion of the finger versus the motion of the background. If both motions are synchronous, then it would indicate we are viewing a picture rather than a live finger. Other methodologies such as machine learning, where we train the system to recognize what a finger image from a live finger looks like versus a photo when processed by ONYX can be employed as well. At present, the implementations we have been involved with have made the likelihood of a bad actor having a suitable image of a person's finger, and be in possession of a person's device extremely low, so there has not been a need to explore liveness detection further. DFT is poised to be an industry leader in the mobile biometrics market, which currently produces annual revenue of $21B. Furthermore, the solutions we offer cross over into numerous markets projected to soon total hundreds of billions of dollars per year. Our technology is second to none; our strategies are sound, and our leadership strong; DFT will provide the safest, fastest and most accurate biometric technology in the market. For more, visit www.diamondfortress.com.